We all know the story of ‘Seven blind men and an Elephant’ as an excellent fable of how personally attached perspectives can deceit us from the bigger picture; the reality. Your brand’s digital strategy can end up being another similar story, unless if you act soon to appoint a qualified enough person to manage this bigger realities surrounding your brand. When digital marketing is new to a company, they tend to be in a state of uncertainty about where to put their digital ad money they set aside in the annual marketing communications budgets. They know digital is important, they know social is growing, and they’ve heard that search marketing can be really effective. Yet still, most companies will not have a faintest of a clue on where to begin their journey on digital and social media marketing. This uncertainty opens up a loophole in your entire approach to digital marketing, leaving other organizations (who always in the look for how to grow their business) and self-proclaimed experts to sneak in and exploit your ‘fear of being left out in the digital party’. Everybody knows digital is growing in Sri Lanka, but not everyone will agree on where the best potential for your brand lies. One expert might tell you Social is bigger, therefore you should put all your eggs on Facebook basket. Another expert who’s bread & butter comes from Google Adwords will tell you Facebook is a fad which doesn’t covert into any tangible business results, and will ask you to put all your money into a Pay Per Click Adwords campaign. Meanwhile, here comes the SEO specialist! He will tell you 101 reasons why you shouldn’t waste your money on PPC and how quickly he can bring your website to top 10 organic results on Google. On top of differing opinions bombarded at you by these various experts and companies, you will have to deal with at least a dozen more of marketing executives of different web publishing companies trying to sell you a prime ad slot on their websites. According to them, spending your entire ad budget on a home page banner on their website is everything about digital marketing! Now you see where I’m trying to get at. Level of awareness of digital marketing among Sri Lankan marketing managers is at a very low point, and as a result they easily get carried away by compelling propositions and presentations delivered to them by some biased experts (Ones I explained above). The best approach a company can solve this problem is by recruiting an in-house person to manage and coordinate the company’s digital marketing efforts. Now, don’t confuse what I’m saying here.. To be very clear on this, I’m NOT advising you NOT TO HIRE AN AGENCY. Just like you have an in-house corporate communications manager to coordinate with your PR agency, you need an in-house digital marketing manager to coordinate with your digital agency and other parties you may have to deal with. 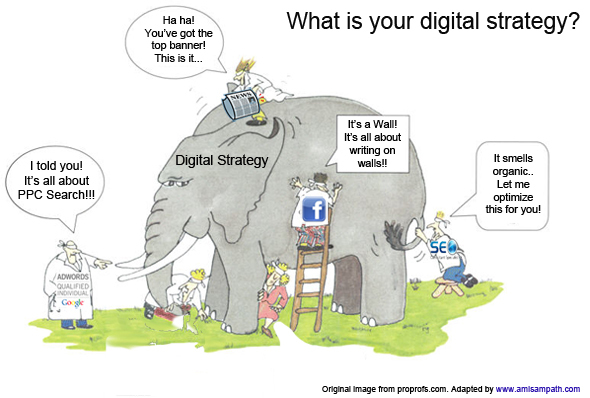 This in-house expert should have a clear understanding of the “bigger picture” of digital marketing, and he or she should not be someone who is biased towards Social (Facebook) or towards Search (Google) or any other platform or tool. This person’s job is to first put together a clear digital roadmap for the brand, and set some guidelines. Once you have this sort of clarity of your digital strategy, then you can independently evaluate what those external experts will preach you. Nobody will be able to trick you to sell a home page page-peel for LKR.500,000/- or to convince you to do a search campaign for a set of totally irrelevant keywords for a commodity FMCG brand. I’ve worked with clients who have in-house digital experts working in their marketing team, and with companies who don’t. In my experience, for a digital agency, it becomes extremely easier to work with a client who understands the subject very well. But yet, many digital agencies fear when they hear the news a client is going to hire an in-house digital expert, thinking that this is the first step of internalizing of digital marketing function. For them what I have to tell is, if you are confident that you can add an exclusive value to your client’s overall digital strategy, there’s no reason for you to feel insecure. If what you offer your client is just a service of updating their Facebook page and Twitter; then, yes you deserved to be kicked out and replaced with a low paid in-house executive to do the same job!